"Hold on to your butts..."
First of all, it should be said that Jurassic Park is my favourite movie, of all time, bar none. Why? It’s got everything. Relationship building, action, adventure, humour and it has freakin' dinosaurs! But I digress. One of the biggest takeaways from this movie, leadership-wise, is that we can too heavily depend on one person. 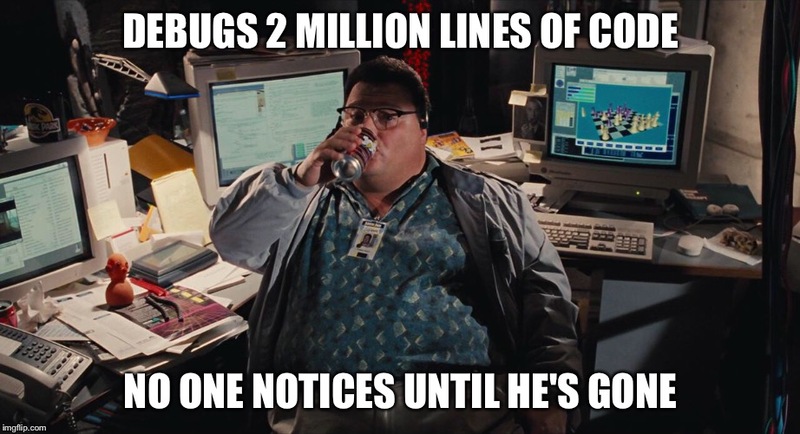 Sam Jackson’s character in the movie says “I can't get Jurassic Park back on line without Dennis Nedry.” And that when everything hits the fan. The fences are down, the man-eating raptors are out, Lex and Tim are out in the park with raging beasts, Malcolm has been tossed by a t-rex, and the tour has taken on some serious casualties. Not to mention the extensive damage to the vehicles on site which were top of the line - they spared no expense. Plus, a guy gets eaten while sitting on the toilet. Not a way anyone wants to go. So what could have saved them from this ill fate? Other people knowing how to do other people's jobs. That is why I believe that all companies should have the “If I Die” clause in effect. What is this you say? And why does it sound so morbid? Well, the fact of the matter is that everyone dies. We get no say in how or when. And if they don’t die, there are a trillion other things that can happen. And when they do, does your company just stop? Do all of your dinosaurs get out? There should always be some crossover so that when your Nedry disappears, or gets sick, or finds a new job, or has a baby, or decides to steal all of your dinosaur DNA and sell it to the highest bidder, you are covered. Aside from the dino DNA… in that case you're hooped.